7 FER, N. de. 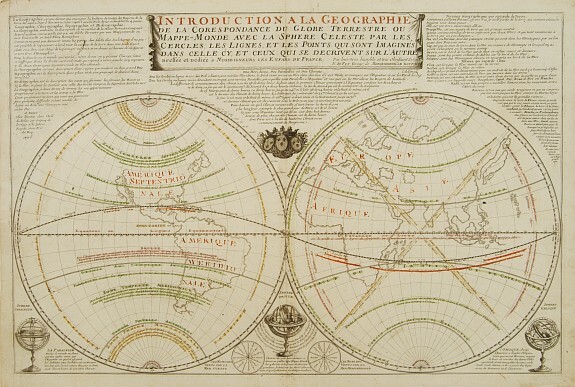 Introduction a la Geographie de la Corespondance du Globe Terrestre ou Mappe-Monde� ( Paris, 1705) Limites en col. d'�poque. - Paper slightly age-toned as usual. Original outline colour. 460 x 700 mm. 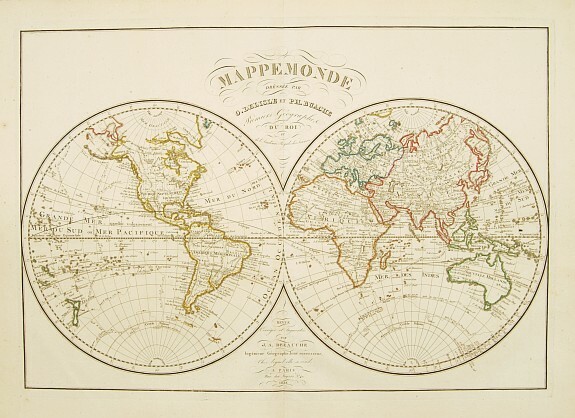 � Large and boldly engraved double hemispheric map with California as an Island. Decorated with three armillary spheres, a crest and long descriptive notes at top. The hemispheres contain numerous notes and comments while inland detail is rudimentary. 8 SEUTTER, M. Diversi Globi Terr-Aquei Statione Variante et Visu� ( Augsbourg, 1725) Col. Pli central consolid�, papier l�g�rement jauni, quelques rousseurs, petite d�chirure dans l'angle inf. gauche. - Paper slightly spotted, some discolouration and reinforcement along centre fold, hardly notable, minor tear lower left part. 495 x 575 mm. 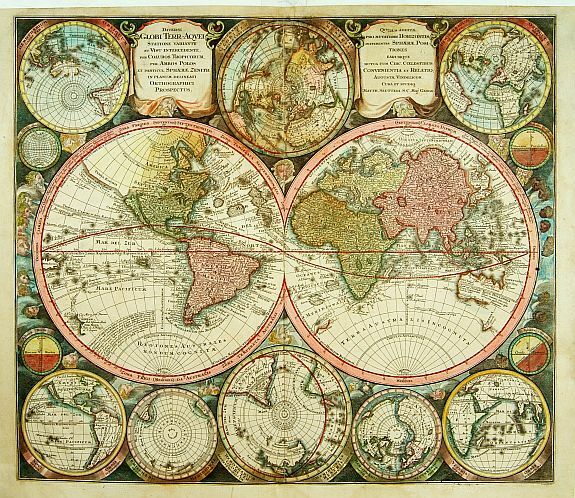 � The traditional decorative borders of many seventeenth-century world maps have disappeared. Seutter's twin central hemispheres are surrounded by eight smaller projections depicting the world from various angles, and four smaller circular diagrams. The map is a close copy of that by Carel Allard (1696), the cross-hatched background is changed into many wind blowing angels. On this map Hokkaido is even larger than Honshu and both islands are connected. California is an island. The oceans contain extensive routes of the explorers. New Holland is still incomplete; there is no South Polar continent. An exceptionally well engraved plate, wind heads are visible in the darkly engraved cross-hatched background. 9 DELISLE, G . / BUACHE, Ph. / DEZAUCHE, J. Mappemonde Dress�e par G. Delisle et Ph. Buache... Revue... Par J. A. Dezauche. ( Paris, 1828) Limites en col. d'�poque. Bel exemplaire. - Mint condition. 457 x 665 mm. � Annotations manuscrites comportant des indications de latitude et de mois, le long de l'h�misph�re Est, principalement entre l'Australie et le P�le Antarctique ainsi que dans l'angle sup. gauche de la carte. - Latitude manuscript annotations along the Eastern Hemisphere between Australia and the Antarctic.